The design feature that jumps out the most on this next version of the retro-styled Beetle is the flattened roof which also seems to have squeezed the window lines too. The next Beetle is also said to offer more interior space. 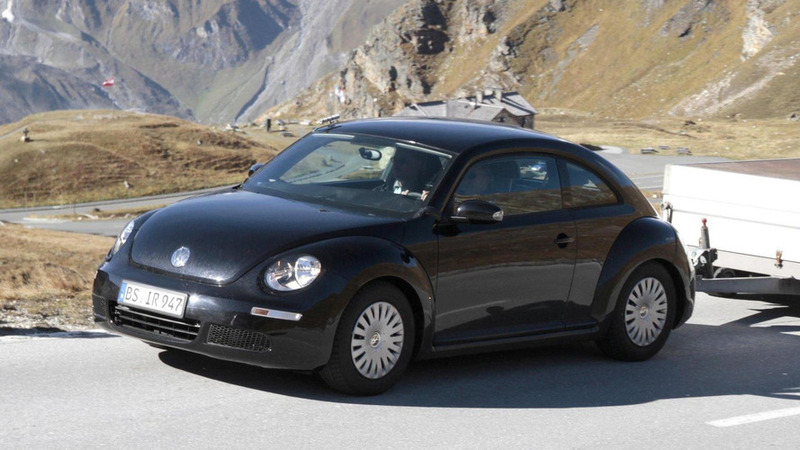 Here are the latest spy shots of the next-generation Volkswagen Beetle doing some alpine testing in Europe. The design feature that jumps out the most on this next version of the retro-styled Beetle is the flattened roof which also seems to have squeezed the window lines too. The windscreen and A-pillar appear more upright than on the current model and previous reports have it that the next-generation Beetle will offer more interior space. The way the back end slopes down and the rear wheel arches bulge out is also more reminiscent of the classic Beetle than the revived one of the last decade. The prototype spotted here is pulling a trailer. Which may indicate VW is testing the prowess of the engine offerings it intends to feature in the next Beetle. Those engines start with the 1.2 liter 106 PS (78 kW) and range up to the 2.0 liter TFSI with 213 PS (157 kW) on the petrol side. For the diesels there'll be the 106 PS 1.6 TDI and the 2.0 liter TDI with 142 PS (104 kW). The next-generation VW Beetle is expected make its debut at the Detroit motor show next January and go on sale sometime after that in 2011.